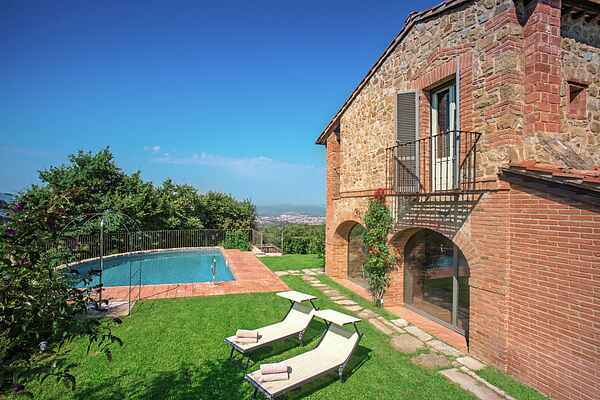 This villa is located on a wine estate in the hills near Arezzo at 550 meters altitude. The estate consists of woods and vineyards. The owner is very environmentally conscious and the wines are organic. The villa has two floors and is very elegant and comfortable. The villa has a dining room and kitchen on the ground floor and a spacious loggia with huge windows. These windows can be completely open so it looks like a covered terrace. The pool is in the garden, next to the dining room and loggia. The villa is typical Tuscan countryside and the interior of the villa is very elegant and chic. You have a beautiful view over the valley, the surrounding hills and the city of Arezzo from the villa and garden. It is possible to join a wine taste tour. Something is told about the nature, wine and history. Afterwards there is a visit to the beautiful wine cellar. The tour concludes with a tasting of organic wines. Relax, nature and privacy are the unique combination for a holiday in Villa Melograno.